By Costa Maragos Posted: February 2, 2018 6:00 a.m.
A thin black bar, about 30 centimetres long and a centimeter wide, is helping bring a new found freedom for people with mobility challenges. Now a U of R research team is putting this technology to greater use. The Tobii 4C eye-tracker allows people to use their eyes to navigate a computer screen. The tracker is typically needed by people who are unable to use a computer interface that requires a mouse, trackpad and a keyboard. 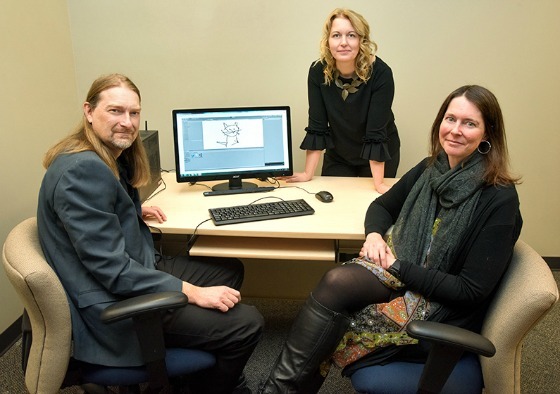 “I’m very excited with what we can do with this,” says Megan Smith, Assistant Professor in Creative Technologies in the Faculty of Media, Art, and Performance and a member of the research team. “We expect several people with mobility challenges to be there,” says Dr. Christian Riegel, Professor of English at the U of R’s Campion College. This research is all about collaboration. Riegel is the project lead and is working with Megan Smith (MAP), Katherine Robinson, Professor of Psychology at Campion College and Randy Johner, Associate Professor of Social Work. People from the community are encouraged to take part in the hackathon which is designed to allow people from a range of disciplines and backgrounds (faculty, staff, students and community members) to start with a basic kit of a small portable eye tracking unit with code written specifically to control the unit and a computer. The task of each team is to devise ways to use the technology to create art. “A hackathon format is ideal for this task as it allows people from multiple backgrounds to approach the challenge and to inform possible ways to a solution,” says Riegel. 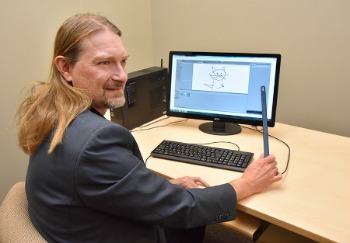 Participants will use the eye tracker to draw lines, objects, and shapes of various kinds on a computer screen as a way to express themselves creatively. The U of R team is working with Carlton University’s Visual Simulation Lab, which is also holding a hackathon. A joint follow-up colloquium will be held to compare notes. However, the researchers are involving people from the community, including presenting research results. In the meantime, there are still some spots open for anyone wanting to take part at the Hackathon. When: Saturday February, 3rd, 9:00 a.m. - 6:00 p.m.
Coffee breaks and lunch will be provided free of charge for all participants.